This drawing is a metaphor or illustration of how I see & regard the Bible Cartoons as a multi-faceted project. It shows the various pieces of the metaphorical “jigsaw puzzle” like money, time, skills, etc, all in place. It is convenient for me to imagine each aspect of the project as a seperate piece of the “puzzle”, but it is also useful to see how they fit together to make up the whole “picture” of Bible Cartoons. The design came to me when my wife & I were on holiday in South Wales, in August 2012. It’s taken me this long to draw the picture & write the blog about it! The pieces already in the “jigsaw puzzle”. 2) Skills – all of the creative, imaginative & artistic skills that I have, which allow me to draw & colour the artwork. Also includes my interests in science, writing, organising information & the desire to research the Holy Land. 3) Love & Support – Here I am acknowledging the love of my wife, family & friends, which provides the support necessary for me to pursue this project. Without them I would probably not be able to carry on doing what I do. I also acknowledge the love of God as being of central, prime importance to me. I need to feel comfortable, secure & (reasonably) confident that things will work out OK, in order to continuously turn my attention to the artwork. 4) Desire – Without the drive & desire to keep drawing & producing cartoons, I wouldn’t get anything done! The desire, drive & self-motivation to succeed is of vital importance when you’re essentially a one-man band! 5) Technology & Equipment – Without my trusty PC & particularly the internet, it wouldn’t be possible for me to display & sell Bible Cartoons all over the world. 10-15 years ago this Bible Cartoons project wouldn’t have been possible, because the internet was in its infancy. I rely on the internet for the vast majority of my Bible research answers to; without that it would be much, much harder to produce the quality cartoons that I draw. 6) Money – Without the loving support of my wife, Bible Cartoons couldn’t have even begun. Now it is generating enough money to keep the website on-line, & we hope & pray for increased sales, which will allow this to continue for a l-o-n-g time to come! 7) Time – I recognise that the Bible Cartoons project is my full-time occupation, job, career, mission, ministry & vocation. If I had to pursue another paid, part or full-time job, then I wouldn’t be able to draw these cartoons. I am immensely grateful for the opportunity to devote my time & life to the Bible Cartoons project. 8) Ideas – I seem to have an endless supply of imaginative concepts, ideas & pictures in my mind, which are the basis of my cartoons. One of the many ways God has uniquely blessed me is with a highly inventive & constructive imagination. 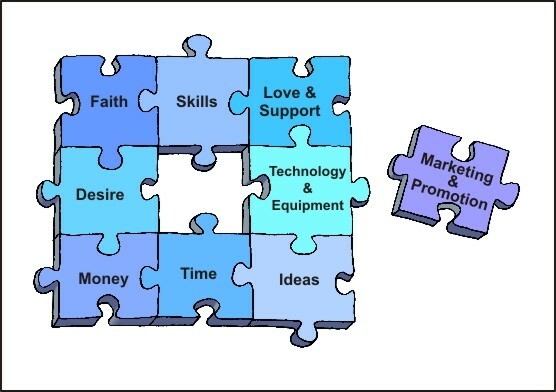 These are the 8 key pieces of the jigsaw which I have identified as being of prime importance. No doubt I could identify many other aspects or pieces which could also be included in the jigsaw puzzle. What about the missing piece? We have more customers this year than we had last year. New people are finding my cartoons via the internet every day. Customers regularly return & view/buy additional cartoons. For this we are extremely grateful. We have done little in the way of marketing & promotion, so really our thanks & gratitude is rightly directed towards the Lord God, who has brought us the customers we have. Having said that, we also believe that it is right & appropriate to take responsibility for the Marketing & Promotion of Bible Cartoons. It would be madness to simply sit back & hope that people will find our website & buy the cartoons. We need to be far more pro-active than that! That is why, in the illustration above, the marketing piece is missing – I feel that we are lacking the proper promotional piece(s) to complete the project mix. Whilst I research marketing strategies on line & read books about it often, I still feel unsure of the best way to “get the word out” that Bible Cartoons exists. I send individual churches emails to make them aware of us, but that is a laborious process… there must be a better, more efficient, more cost effective way to reach many more church leaders, Sunday school teachers & interested parties than that! But that method eludes me… at the moment! There simply doesn’t seem to be one sure-fire, all-encompassing method to reach all the customers we would like. I frequently write Twitter & Facebook articles, add new Blog articles (like this one) & we get referrals from these sources, which is great. But despite these efforts, we still haven’t got masses of Christian church leaders, teachers, youth workers, Evangelists, etc beating on Bible Cartoon’s cyber-doors! Perhaps this situation is a reflection of every small (& large?!) businesses’ dilemma: it’s all well & good producing the most spectacular product in the world, but if no-one knows about it, you can’t sell it! So the missing piece, as far as I am concerned is identifying & implementing a decent, growing, artistic, successful marketing campaign. If you are a marketeer who would like to suggest ways we can increase public awareness of this Bible Cartoons Project, then please contact me on email, I’d love to hear your ideas.